My heads-up tachometer was designed specifically with racing in mind. I used three different colors of LED so I could tell the RPM based on color recognition alone using peripheral vision. By using a heads-up system similar to military aircraft I can eliminate the need to look away from the track or cones. I used color to indicate when a downshift would be benefitial instead of an arbitrary "green-yellow-red" color scheme. Of course, you are free to make up your favorite scheme. VIDEO NOTES: The video camera position makes the lights appear higher than they actually are in my field of view. 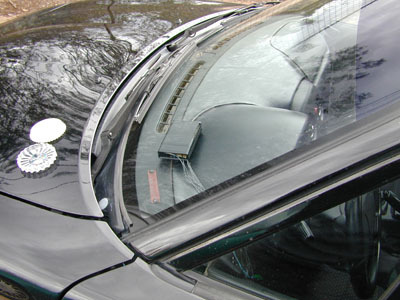 Put a white slip of paper and look at the reflection in the windscreen to determine where you want to place it. Where I put mine it is directly behind the barndoor when up. The color in the video is also a little washed out. APPLICATION NOTES: Mulitple LM3914 can be connected in series to produce longer, more detailed LED displays. 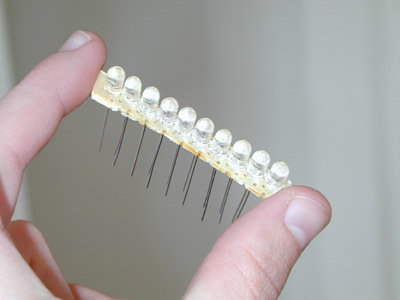 Using this you could chain up to 100 LEDs in a display that would be very detailed and accurate. 10-20 is probably the most practical though. Additionally, the LM3914 can light the LEDs in either dot or bar mode. The circuit diagram below shows the bar configuration. My video shows the dot mode. I found the bar mode to be anoyingly bright and the extra lamps tended to blur together in my peripheral vision making color distinction difficult. If you are planning a monochrome display then you will find the bar mode more useful (duh). To change to dot mode simply don't connect pin 9 on the LM3914. The LEDs I bought were all 2000mcd in brightness. I would say that this is the minimum brightness you would want to still be able to see them in direct sunlight. Do your best to get them all in a close mcd rating so one isn't brighter than the rest. Also make sure they all have the same voltage drop so the dimming circuit works evenly. However I did use a brighter single LED to indicate redline, although it doesn't show well in the video. LEDs of this brightness also happen to have a very narrow viewable angle. The result of this is that the LEDs must be pointed directly at your face (reflected in the glass) in order to get the maximum brightness in the reflection. It turned out to be the hardest part of construction to get them reflecting right at my head. 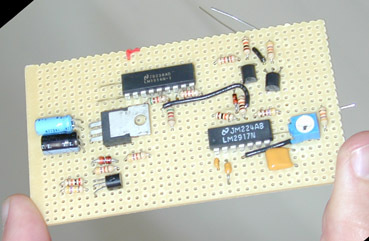 Refer to www.nsc.com for data sheets on the LM2917 and LM3914 chips. WARNING:I am not an electrical engineer. Anything you hook up to your car you do at your own risk. For all I know the gadget I've made will burn my car to the gorund while I sleep tonight. Therefore if you're thinking about blaming me because you made one of these and fried your ECU or worse... you've been warned. The chips in this project can't handle 12 volts. Additionally, the voltage in your car tends to vary all the way between 8 and 14+ volts as you drive. This section protects the chips from this variation. 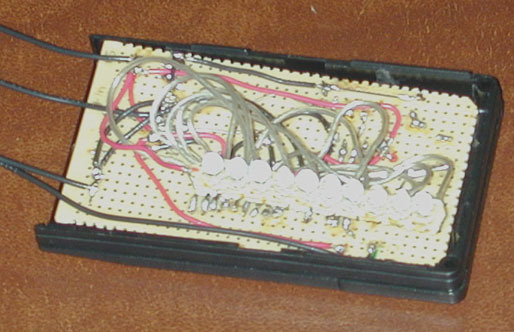 All positive connections in the following diagrams should be connected to the 8v+ output from this circuit. NOTE! I didn't really have a 90-93 Miata to test this on. Based on my best info the above suggestion will only work with the area marked in red omitted from the design for 90-93 cars. Use the 50k variable resistor labeled R1 to adjust the redline. Input for the 90-97 cars comes form the IG or 1G pins on the diagnotsic connector under the hood. I'm not sure about the 99+ cars. The 2k resistor in the headlight dimmer section determines how dim the LEDs go when you turn your lights on. Increase the resistance here to make them even dimmer to your preference. Bar mode shown above. 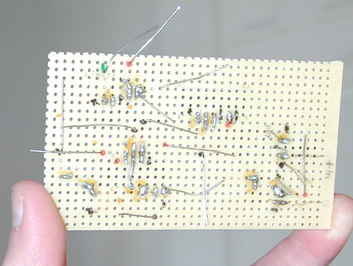 Disconnect pin 9 to display in dot mode. 10 high-brightness LEDs of your favorite colors. The millicandella rating of the LEDs should be similar and at least 2000 mcd in order to be visible in direct sunlight. If you don't plan on a heads-up system then 1000 mcd would be plenty. Special thanks to Paul Hill of the Northavon Mini Drivers Club for the original circuit ideas. If anybody knows where Paul is tell him it worked!